Forty years ago today, the United States launched the Mariner 9 spacecraft on a mission to Mars. Among other achievements, Mariner 9 would become the first terrestrial spacecraft to orbit another planet other than Earth. The Mariner Program was a NASA project whose goal was to investigate the planets Mars, Venus and Mercury from space. A total of ten (10) Mariner spacecraft were launched between 1962 and 1973. Seven (7) of these pioneering missions were considered successful. The first interplanetary flyby, the first orbiting of another planet and the first gravity assist maneuver were all accomplished by Mariner spacecraft. Each Mariner was built around a central bus or housing that was either hexagonal or octagonal in shape. All spacecraft guidance, navigation, propulsion, communication, power and instrumentation systems were contained within or attached to this central bus. Mariner spacecraft were typically configured with a set of four (4) solar panels for power. However, Mariner’s 1, 2 and 10 used just two (2). Cameras were carried by all Mariner space probes with the exception of Mission’s 1, 2 and 5. Mariner 9 carried a scientific instrumentation package that consisted principally of an imaging system, ultraviolet spectrometer, infrared spectrometer and infrared radiometer. Fully deployed, each pair of solar panels measured 22.6-feet across. These panels provided 800 watts of power at Earth and 500 watts at Mars. Power was stored in a 20-amp-hour nickel-cadmium battery. Mariner 9 lift-off mass was 2,196 lbs. Propellant useage during the flyout to Mars resulted in a spacecraft mass of 1,232 lbs in Martian orbit. Scientific instrumentation accounted for 139-lbs of the on-rbit mass. Spacecraft propulsion for mid-course corrections and orbital insertion was provided by a 300-lb thrust liquid rocket motor burning monomethyl hydrazine and nitrogen tetroxide. Mariner 9’s 3.28-foot diameter antenna telemetered data back to Earth at rates of 1, 2, 4, 8 or 16 kilobits/second using dual S-band 10 watt and 20 watt transmitters. Mariner 9 was launched from Cape Canaveral’s LC-36B at 22:23:00 UTC on Sunday, 30 May 1971. An Atlas-Centaur SLV-3C launch vehicle provided the propulsive energy required to climb out of the Earth’s gravity well and send the probe on its way to Mars. It would take Mariner 9 roughly 167 Earth days to travel a distance of 214.85 million nautical miles to the Red Planet. 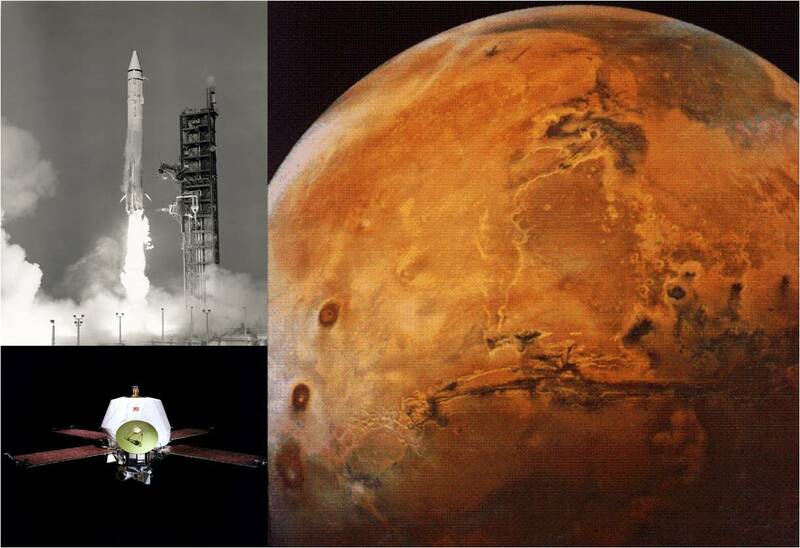 Mariner 9 entered Mars orbit at 00:18:00 UTC on Sunday, 14 November 1971. This marked the first time that a terrestrial spacecraft had achieved orbit about another planet in our Solar System other than Earth. Initial orbital parameters included an apoapsis of 9,672-nm and a periapsis of 755-nm at an inclination of 64.3 degrees. Interestingly, Mariner 9 arrived ahead of the Soviet Mars 2 space probe despite the latter’s eleven (11) day head start. A planet-wide dust storm greeted Mariner 9 upon its arrival in Mars orbit. Hence, imaging of the planetary surface did not begin in earnest until late November. However, it was not until mid-January 1972 that the storm had subsided to the point that high quality images could be obtained from orbit. Mariner 9 ultimately took 7,329 images which covered 100% of the Martian surface. The photos revealed a fascinating planetary topology that featured river beds, craters, extinct volcanoes, mountains and canyons. Mariner 9 discovered Olympus Mons, the largest known extinct volcano in the Solar System. Valles Marineris, a system of Martian canyons measuring 2,170-nm in length, was named after Mariner 9 in tribute to the probe’s significant space exploration accomplishments. Photographed as well were the diminutive Martian moons of Phobos and Deimos. Upon depletion of its attitude control system propellant supply, Mariner 9’s mission was officially terminated when the spacecraft’s systems were turned-off on Friday, 27 October 1972. Total time spent investigating the Martian environment from orbit was 349-days. Though long silent, the craft remains in orbit around the Red Planet. It is expected to continue to do so through approximately the year 2022. 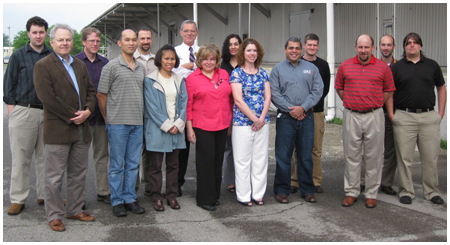 On 23-26 May 2011, White Eagle Aerospace held its popular Basic Missile Aerodynamics short course at the National Air & Space Intelligence Center (NASIC) outside of Dayton, OH. NASIC, headquartered at Wright-Patterson Air Force Base, is the principal provider of foreign aerospace intelligence to the US Department of Defense. This was the second Basic Missile Aerodynamics technical training course held at Wright-Patterson Air Force Base, OH. The initial offering, held 16-19 August 2010, was hosted at the distinguished Air Force Institute of Technology (AFIT). Basic Missile Aerodynamics is designed and taught by J.Terry White, company founder and Aerosciences Instructor at White Eagle Aerospace. The class provides a focused training experience in the aerodynamics of tactical missiles, ballistic missiles, launch vehicles, sounding rockets and projectiles. The comprehensive course material also serves as an ideal foundation for more technically advanced studies. White Eagle Aerospace is honored to serve the military and civilian personnel of both the United States Air Force and the US Department of Defense. The WEA team extends sincere gratitude to each student who attended the Basic Missile Aerodynamics course and a special note of appreciation to Mr. Nathan Setters, Ms. Jennifer Toth and Ms. Aurea Rivera (Technical Director, NASIC Data Analysis Group) for their assistance in facilitating this course. J Terry White, President/CEO of White Eagle Aerospace will be a featured speaker at the upcoming Spacefest III. Spacefest is a thrilling event for space enthusiasts of all kinds, with subjects ranging from astronomy to manned exploration, robotic exploration, commercial space and space history. Mr. White will be delivering a special presentation entitled, Apollo Remembered. This inspiring presentation will take you on a memorable journey through the famed Apollo missions – arguably, mankind’s greatest adventure! The talk is scheduled to begin promptly at 12:30 pm on 03 June 2011. Spacefest III will feature highly acclaimed scientists, astronomers, professors, authors and speakers from the aerospace community, as well as the largest gathering of astronauts in recent history. The celebrated group will include six of the twelve men who have been priveledged to set foot upon the moon, namely: Buzz Aldrin, Gene Cernan, Dave Scott, Alan Bean, Charlie Duke, Jim Lovell and Edgar Mitchell. Spacefest III will be held 02-05 June 2011 at the JW Marriott Starr Pass Resort and Spa in Tucson, AZ. Forty-seven years ago this month, the No. 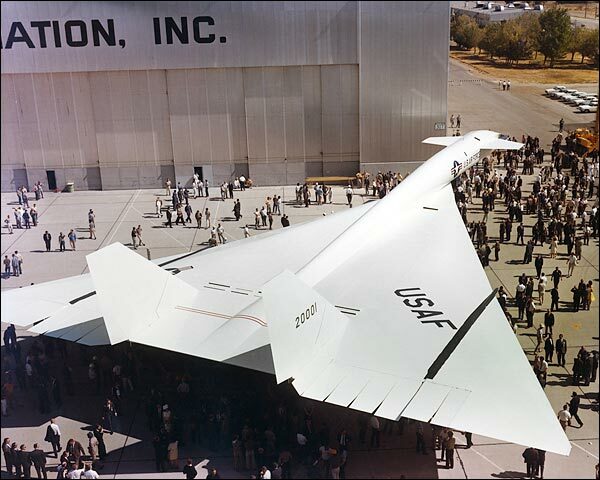 1 USAF/North American XB-70A Valkyrie aircraft was officially unveiled to the aviation public in a rollout ceremony conducted at USAF Plant 42 in Palmdale, California. The Great White Bird’s public debut occurred on Thursday, 11 May 1964. The XB-70A Valkyrie was designed as an intercontinental bomber. Its original mission was to penetrate Soviet airspace and drop nuclear ordinance at Mach 3 and 70,000 feet. However, that mission was cancelled before the type ever flew. It was ultimately relegated to the status of an experimental flight research vehicle. The XB-70A graced the skies of America between September 1964 and February 1969. It is to this day the largest triple-sonic aircraft ever flown. The aircraft measured 189 feet in length and had wing span of 105 feet. Gross weight topped out at around 540,000 lbs. Over half of that weight (290,000 lbs) was JP-6 jet fuel. The Valkyrie was powered by six (6) General Electric YJ93 all-afterburning turbojets. These engines were designed to operate in continuous afterburner at Mach 3.2 and 95,000 feet. Total sea level thrust of the “6-Pack” was in excess of 185,000 lbs. The YJ93 was a contemporary of the Pratt and Whitney J58 turboramjet which powered the fabled USAF/Lockheed SR-71 Blackbird. Only a pair of XB-70A airframes were built and flown; Air Vehicle No. 1 (S/N 62-0001) and Air Vehicle No. 2 (S/N 62-207). Together, these aircraft flew 129 flight tests totaling 252.6 flight hours. Ship No. 1 flew two-thirds of the XB-70A flight tests. The highest Mach number achieved during the XB-70A flight test program was Mach 3.08. This feat was accomplished by Ship No. 2 on Tuesday, 12 April 1966. XB-70A Ship No. 2 also achieved the highest altitude of the XB-70A Program. Specifically, this aircraft attained a cruise altitude of 74,000 feet on Saturday, 19 March 1966. This mission included 32 minutes of continuous Mach 3 flight. Eight (8) men flew the XB-70A. This line-up included Alvin S. White and Van H. Shepard of North American, Col Joseph E. Cotton, Lt Col Fitzhugh L. Fulton, Lt Col Emil (Ted) Sturnthal and Maj Carl S. Cross of the United States Air Force, and Joseph A. Walker and Donald L. Mallick of NASA. The Valkyrie pioneered the use of numerous technologies including exploitation of the NACA Compression Lift Principle, development of honeycomb sandwich structural materials, and use of its fuel as a heat sink. The XB-70A was also used as a testbed for sonic boom research and a myriad of other aerodynamic and aerothermodynamic experiments. The Valkyrie also provided significant support to the ill-fated American Supersonic Transport (SST) effort. XB-70A Ship No. 2 was lost in a collision with a NASA F-104N Starfighter near Edwards Air Force Base on Wedneday, 08 June 1966. This mishap took the lives of Maj Carl S. Cross and Joseph A. Walker on what is still referred to as the “Blackest Day at Edwards”. Ship No. 1 survived the XB-70 flight test program and is displayed today at the National Museum of the United States Air Force in Dayton, Ohio. Forty-nine years ago this month, Mercury Astronaut M. Scott Carpenter orbited the Earth three times aboard his Aurora 7 Mercury spacecraft. In doing so, Carpenter became the second American to reach Earth orbit. Deke Slayton was to fly the Mercury-Atlas 7 (MA-7) mission. However, before that happened, the dreaded flight surgeon cabal grounded Slayton for what they claimed was a heart murmur. Despite Slayton’s utter incredulity and vehement protests, the decision held. Project Mercury officials maintained that the space program could ill afford the negative political fallout occasioned by the death of an astronaut on-orbit. Much of the activity on the first and second orbits involved Carpenter maneuvering his spacecraft, conducting scientific experiments and observing the Earth from space. Among other discoveries, he discerned that John Glenn’s mysterious “fireflies” were simply particles of ice and frost that had accumulated on the shadow side of the spacecraft. When the spacecraft structure was bumped or vibrated, these particles would disperse from the external surface of the spacecraft and float into space. Once in the strong sunlight, the particles seemed to glow or be luminescent. As retro-fire approached, the intermittent pitch horizon scanner malfunction reappeared at a most inopportune moment. The automatic stabilization and control system suddenly would not hold Aurora 7 in the proper attitude for retro-fire; heatshield 34 degrees above the horizon at zero yaw angle. Carpenter switched to manual mode in an attempt to align the spacecraft properly for retro-fire. Since Aurora 7 was listing badly and help was about an hour away, Carpenter extricated himself from the spacecraft and deployed his life raft. While a radio beacon helped recovery forces locate him, there was no voice communication between the astronaut and his rescuers. Carpenter was on the water nearly 3 hours before being picked-up by rescue helicopters and delivered to the carrier USS Intrepid. Some six (6) hours later, Aurora 7 was brought onboard the USS John R. Pierce. Criticism of another’s performance comes easily in this world. However, as Theodore Roosevelt pointed out, it really is “The Man in the Arena” that counts most. In Scott Carpenter’s case, we simply turn the reader’s attention to NASA’s own post-flight report entitled “The Results of the United States Second Manned Orbital Mission”. Among other things, the subject report concluded that the Aurora 7 pilot overcame a “mission critical malfunction” of the pitch horizon scanner and “achieved all mission objectives”. And may we say that in so doing, Scott Carpenter’s MA-7 experience provides yet another validation of the man-in-the-loop concept so critical to the success of manned space operations. Sixty-one years ago this month, Viking No. 4 soared to a record altitude of 91.2 nautical miles following launch from the USS Norton Sound. Known as Project Reach, the flight was conducted by the United States Navy to demonstrate the feasibility of using ship-launched rockets to carry scientific payloads into space. 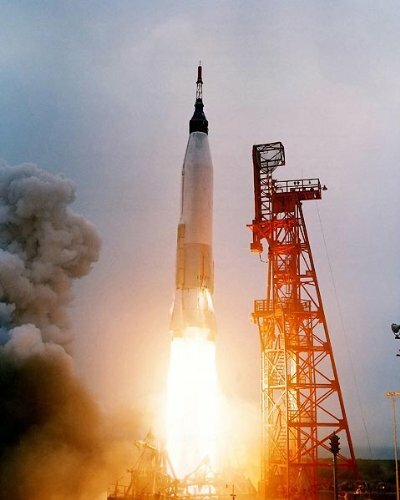 The Viking rocket was the first large-scale, liquid-fueled launch vehicle to be developed by the United States. It’s primary mission was to carry scientific instrumentation and research payloads to altitudes as high as 140-nm. As such, the Viking was the domestic follow-on to the V2’s captured from Germany and flown on scientific missions from White Sands Proving Ground (WSPG) in New Mexico. The Glenn L. Martin developed and built the Viking rocket for the United States Navy. The contract for doing so was let in August of 1946. A total of 12 airframes were built for the Viking Program. The Naval Research Laboratory (NRL) flew 11 of these vehicles between May of 1949 and February of 1955. There were actually two Viking airframe configurations. The first 7 vehicles measured 47.5 feet in length and had a diameter of 32 inches. Depending on payload and propellant load, gross weight varied between 9,650 and 11,440 lbs. Viking’s 8-12 measured 41.4 feet in length and had a diameter of 45 inches. The average gross weight was 14,796 lbs. The Viking rocket motor was a product of Reaction Motors Incorporated. It had a sea level thrust rating of 20,000 lbs. As was the case for the V2 rocket powerplant, the Viking’s propellants included alcohol (fuel) and liquid oxygen (oxidizer). Maximum demonstrated rocket motor burn time was 79 seconds for the Viking 1-7 series and 103 seconds for Vikings 8-12. The latter was longer due to the type’s larger propellant capacity. The Viking’s nominal launch site was White Sands Proving Ground (WSPG) in New Mexico. However, early in the program, the Navy showed great interest in launching the vehicle from a ship at sea. The Navy’s biggest selling point for a shipboard launch was that researchers could choose their launch site. While the service had launched a V-2 from the deck of the USS Midway in 1947, the vehicle went into the drink shortly after lift-off when its control system failed. They hoped to do much better with the Viking. 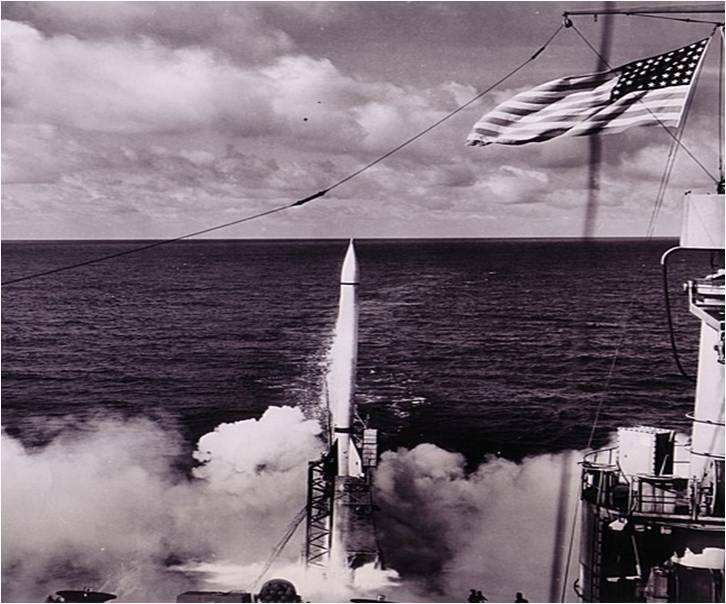 Project Reach was the official name given to the Navy’s effort to conduct a shipboard launch of a Viking rocket. The USS Norton Sound, a ship that would figure prominently in the history of missile and space testing, was selected as the launch platform. The launch point chosen was the intersection of the Earth’s geographic and geomagnetic equators located near Christmas Island in the Pacific Ocean. The primary payload was a cosmic ray experiment weighing 394 lbs. Viking No. 4 lifted-off from the deck of the USS Norton Sound at 1608 hours local time on Thursday, 11 May 1950. The vehicle rose straight and true into the partly cloudy tropical sky. Following a 74-second burn and a 168-second coast, the vehicle achieved an apogee of 91.2 nautical miles; the highest a Viking rocket had flown up to that time. Viking No. 4 impacted the ocean within sight of the launch ship about 435 seconds (7.25 minutes) after lift-off. Impact was supersonic. Viking No. 4 gave the cosmic ray experimenta package a good ride and the data harvest was plentiful. Shipboard launch operations were uneventful in the main and entirely successful. Indeed, the experimentalists, the NRL launch operations team, the USS Norton Sound crew and the United States Navy were pleased with the results of the flight of Viking No. 4. Project Reach was a resounding success. The Viking Program resumed launches back at WSPG in November of 1950. On Monday, 24 May 1954, Viking 11 reached an altitude of 137 nautical miles. It would be the all-time highest Viking flight. The rapid pace of space technology during the second half of the 20th century soon caused Viking to fade into history. However, multi-disciplined technology developed during the Viking Program would influence the design and function of numerous subsequent launch vehicles. Perhaps the most direct example being the Navy’s 3-stage Vanguard satellite launch vehicle. Sixty-four years ago this month, a missile launched on a flight test out of White Sands Proving Ground strayed from the test range and impacted near Ciudad Juarez, Mexico. The non-fatal mishap was attributed to a breakdown in range safety protocol. The V2 missile (Vengeance Weapon No. 2) was developed by Nazi Germany during World War II for the purpose of attacking Allied population centers. As such, it was the world’s first ballistic missile. History records that more than 3,100 V2’s were fired in anger, with London, England and Antwerp, Belgium being the prime targets. Approximately 7,200 people lost their lives in V2 attacks between September 1944 and March 1945. The V2 as flown by the Third Reich measured 46 feet in length and had a maximum diameter of 5.4 feet. Launch weight was 28,000 lbs. The V2’s rocket motor produced a maximum thrust of about 60,000 lbs at sea level. Ethyl alcohol and liquid oxygen served as fuel and oxidizer, respectively. Approximately 19,000 pounds of propellants were consumed in 65 seconds of boost flight. The V2’s payload was an explosive warhead weighing about 1,600 lbs. The fearsome missile’s kinematic performance was impressive for its time. Maximum velocity was around 5,200 ft/sec. After burnout, the rocket followed a ballistic flight path all the way to the target. Maximum altitude and range for wartime missions was on the order of 50 nm and 175 nm, respectively. With the defeat of Nazi Germany, both the United States and the Soviet Union gained access to a large number of V2 missiles and many of the German rocket scientists who developed the weapon. The United States shipped 300 rail freight cars full of V2 missile components back home. Under Operation Paperclip, some 126 German engineering and scientific personnel were expatriated to the United States. Initially operating out of Fort Bliss, Texas and White Sands Proving Ground (WSPG), New Mexico, these men were destined to make major contributions to the American space program. Among their number was one Werhner von Braun. Sixty-seven V2 missiles were launched from White Sands Proving Ground (WSPG) between 1946 and 1952. These flights gave the United States invaluable experience in all aspects of rocket assembly, handling, fueling, launching and tracking. Indeed, V2 rocket technology and lessons-learned were applied in the development of all subsequent American launch vehicles ranging from the Redstone to the Saturn V. WSPG V2’s were also used to conduct numerous high altitude and space research experiments. Many aerospace “firsts” were achieved along the way. The first biological space payloads, first photographs of earth from space and the first large two-stage rocket flights involved the former vengeance weapon. Rocket system reliability was not particularly good in the 1940’s and 1950’s. For instance, only 68% of the WSPG V2 flights were considered successful. Range safety was in its infancy too. In particular, the comprehensive range safety protocol that governs flight operations at today’s test ranges did not yet exist. This state of affairs was largely due to the fact that much of the systems knowledge and operations lessons-learned required to establish such a protocol had yet to be acquired. An incident that occurred in May of 1947 serves to underscore the reliability and safety issues just noted. The Hermes II missile (RTV-G-3/RV-A-3) was a derivative of the basic V2 vehicle. The payload was a forward-mounted, winged, ramjet engine testbed. The V2’s tail surfaces were enlarged to counter the destabilizing influence of the payload’s wing group. The idea was to get the payload up to a Mach number beyond 3 and separate it from the V2 booster. Following separation, the ramjet pack would be ignited and thrust established. The payload would then fly a programmed altitude-Mach number flight profile. While ambitious on several levels, the project was certainly emblematic of this era of aerospace history wherein all manner of ideas took to the skies. On Thursday, 29 May 1947, Hermes II was fired from Launch Complex 33 at White Sands Proving Ground. It was approximately 1930 hours local time. It is noted that the ramjet pack was not active for this first flight. The Hermes test vehicle was supposed to pitch to the north and fly uprange. Instead, it pitched to the south and backrange toward El Paso, Texas. Post-flight analysis revealed that the new inertial guidance system employed by the Hermes missile had been wired backwards! This human error directly and adversely affected rocket system reliability. The WSPG Range Safety Officer(RSO) had both the authority and responsibility to hit the destruct button once it was obvious that the Hermes II was errant. However, a project scientist physically restrained the RSO from doing so! Apparently, the scientist was of the (evidently strong) opinion that the test vehicle’s propellant load should not be wasted on such trivial grounds as the safety of the El Paso populace. Unimpeded now, the errant rocket continued its flight. Range safety protocol would have to be improved and understood by all participants prior to the next flight! The Hermes II reached a maximum altitude of 35 nm on its unplanned trip to the south. During its 5 -minute flight, the vehicle overflew the city of El Paso and impacted near the Tepeyac Cemetary located 3.5 miles south of Ciudad Juarez, Mexico. 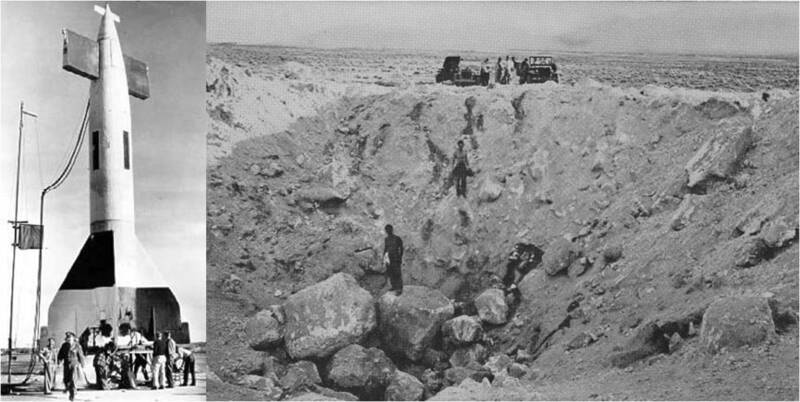 The quasi-Mach 1 impact formed a crater that measured 50 feet in width and 24 feet in depth. Enterprising local residents gathered what little airframe wreckage that survived impact and sold it to souvenir seekers! United States Army authorities quickly arrived on scene to ascertain the extent of the damage caused by the errant missile’s unannounced and unwelcome arrival. Happily, no lives were lost. Profuse apologies were delivered to and graciously accepted by Mexican government officials. The United States paid for all damages and effected a complete clean-up and remediation of the impact site. A member of the team of expatriated German scientists who conducted the Hermes II flight test later was quoted as saying: “We were the first German unit to not only infiltrate the United States, but to attack Mexico from US soil!” Not nearly so amused, the Army tightened-up range safety protocol at WSPG in the aftermath of the international incident. Interestingly, historical evidence points to the likelihood that the Hermes II vehicle never did carry an active ramjet payload on test flights out of WSPG.